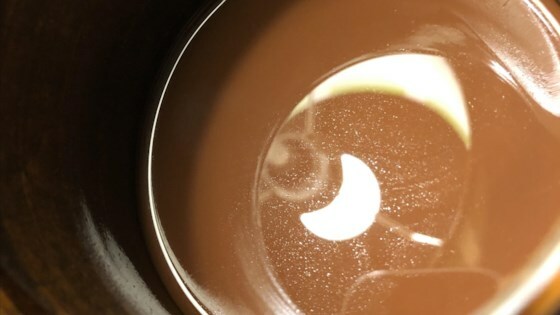 "This bitter, spicy Aztec drink is what modern 'Hot Chocolate' is based from. For a more authentic version the way the Aztecs enjoyed, chill the Xocolatl before drinking." Bring 1 1/2 cup water to a boil in a pot; add the chili pepper, seeds included, to the boiling water and cook at a boil for 5 to 10 minutes. Strain the chili pepper and seeds from the water; return the water to the pot. Add 4 cups water to the chili pepper-infused water, reduce heat to medium-low, and bring to a slow boil. Stir the cocoa powder and vanilla extract into the boiling water; cook and stir until the powder dissolves completely, 5 to 10 minutes.